Opera devised and improvised by the entire cast including Trinity College of Music Contemporary Music Group Chamber Orchestra, soloists, chorus and dancers. 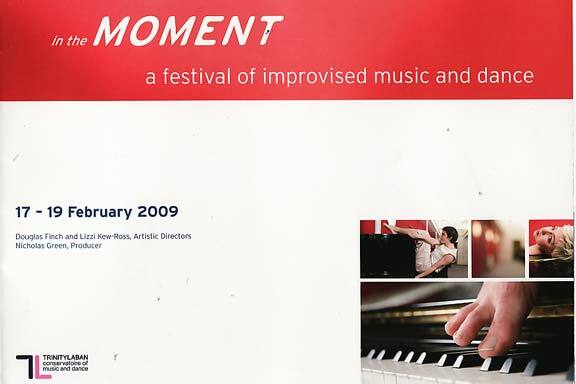 This new 40-minute opera was the culmination of the first day of In the Moment, an innovative Festival of Improvisation, a showcase of music and dance by students and staff of Greenwich's Trinity Laban Conservatoire of Music and Dance, maybe the first such event anywhere? Earlier in the day in the august surroundings of the Old Royal Naval Chapel there had been sounds never before heard there, with sessions of 14th C Cantiga de Santa Maria; organ improvisations on a given theme; pieces created from Earle Brown's Folio etc [see our review of an Earle Brown DVD], and a work by Barry Guy, the famous innovative double bassist and composer, conducted with cards to direct a group's minute by minute improvisations. At Laban, there were opportunities to explore the farther reaches of the prize-winning building and visitors were privileged to watch work in progress in several of the studios before the main event in the Theatre. On stage before the Opera we were privy to several improvised dance works; most engaging Oh Baby, an evocative "energetic and playful duet" by Hagit Yakira and Takeshi Matsumoto who charmed with their athleticism and close, affectionate rapport. 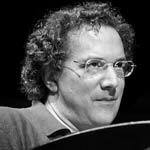 Keenly anticipated were events celebrating the work and presence of Uri Caine, American pianist and prolific recording artist who spans the jazz and classical worlds and never rests on his laurels, a famous improviser " - - a role model for aspiring artists within musical communities and conservatoires of this new century" (Simon Purcell). He rarely comes to UK, but I have been recommending his CDs for a decade and more. Regrettably, Caine's arrangement for Orchestra and Improvising Pianist of Brahms Handel Variations was disappointing as given at Laban, partly because the continuity was broken between the successive variations, which should flow without pauses, attacca. More enjoyable had been Preluding, a sequence of piano improvisations based on Debussy Preludes, given with charm and wit, solo and in duet, by half a dozen of Trinity's Keyboard and Jazz students. The last night was as innovative as the first, an open evening of simultaneous improvisatory performances by students and staff performers connected with both participating organisations, distributed throughout all the rooms and corridors of Trinity College of Music. A multitude of visitors turned up and we were directed in prescribed routes by silently gesturing dance students acting in character as 'guides and commentators'; mysterious and magical. One encountered a room with about eight pianists improvising away apparently unrelatedly; Daryl Runswick dressed up in character as an "oracle", and Linda Hirst double act vocalising with a lovely dancer in and out of a window onto a precarious balcony and then joining a group of oriental dancing, the dancers skirts weighted with lengthy reeds to memorable effect; delicious. I look forward to a film which was being made to capture the atmosphere of this amazing creation, which had been inspired by Scriabin's Mysterium and designed by Ellan Parry. Most importantly, the fruitful conjunction of the music and dance faculties must be built upon and their collaborations continue. * Alexa Woolf adds: In the Dark is an extraordinary achievement by the combined forces of two formerly separate organisations. It draws upon traditions of Western opera in a new way, integrating dance, voices and instrumental music across the stage. 40 minutes of vibrant, professional and seamlessly integrated performances from musicians, singers and dancers made it hard to remember that the elements of this show had been improvised. There was no linear story-telling, but a succession of cameos intimating high voltage chaos at the start, lightened by humorous episodes and ending in a veritable symbol of a contemprary tower of Babel, initiated by a gentle Swiss folksong which ignited a chorus of languages, an unity of differnces and a metaphor for peaceful coexistence and hope.